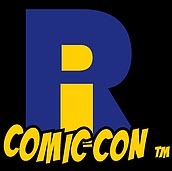 First off, I have been going to this con since it started and I have to say the set-up has become better every year. A couple of years ago, the con put the most popular celebrities on the floor of the attached Dunkin Donuts Center, thus freeing up a lot of room on the exhibition floor. This year, they kept the big names in the DD Center but they moved the rest of the celebrities to an upper floor of the Convention Center, spreading out the crowds more. As a result, the main floor which had the comic creators and the vendors felt much more open and easier to navigate. And the celebrities had more room for their lines upstairs. That was phenomenal. First stop was Bob Layton's table. 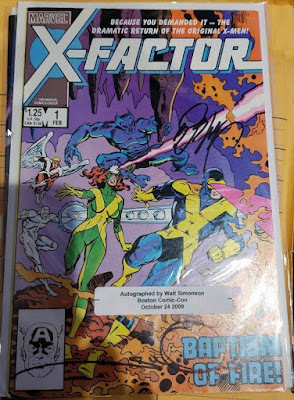 I got there just as he arrived and so was able to get my X-Factor #1 signed by him. I already had Walt Simonson's signature on the book so this was a nice grab. He was sketching but his price was a bit too steep for me. Then I went upstairs to the celebrities. There was a very short line for Laura Vandervoort so I jumped in line. While I was at least coherent this time, I was still nervous as hell. I talked briefly about Smallville and how I felt Kara had so much story to tell on that show. I talked about 'V'. 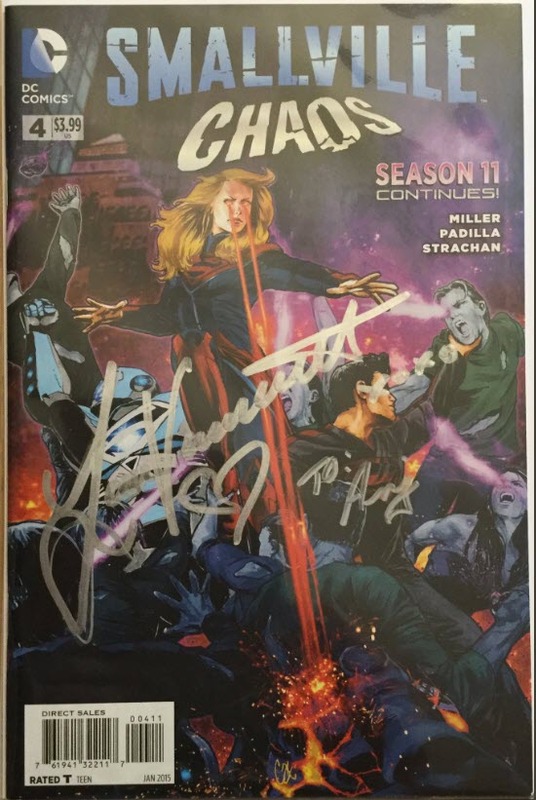 And I talked about her time as Indigo on the Supergirl show. She has a new show coming out on Netflix soon so I'll keep my eyes peeled. 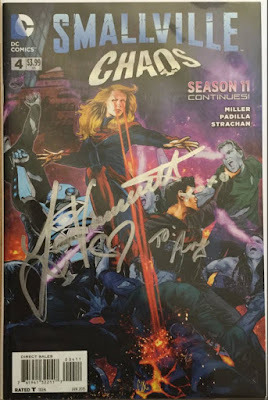 I got a picture with her and got her to sign this Smallville Chaos #4 comic. So cool. And then the big moment, meeting Kevin Eastman. He had several tables in a row, commanding quite a presence, with multiple handlers and workers wearing 'Team Eastman' shirts. 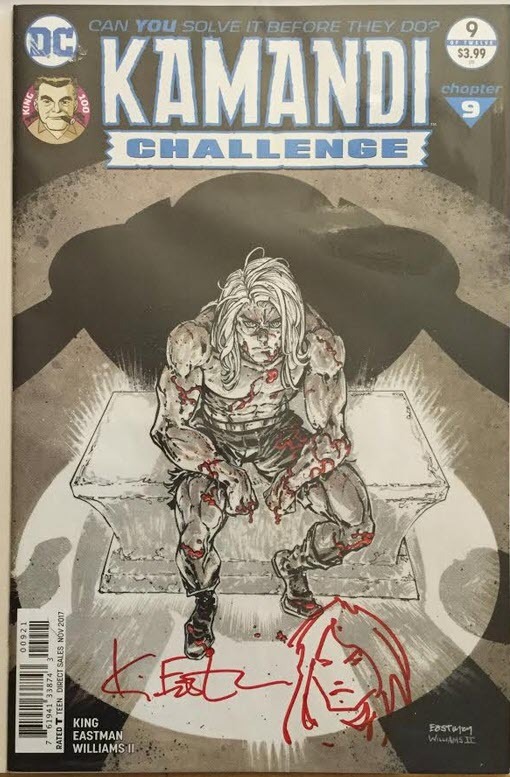 Eastman drew that Kamandi Challenge #9, the Tom King issue, and I love that issue. I have the variant cover he drew so I figured I’d get it signed. Eastman's line was longish but not crazy. He would sign one book for free but every other one would cost $20. I only had the one book for him (while everyone else had stacks of TMNT stuff) so this seemed fine. 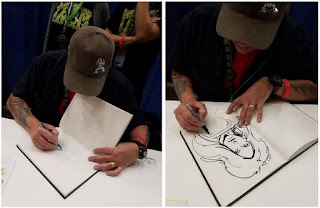 As I waited in the line I saw him doing sketch covers of Turtle characters. The line wasn’t really moving fast because Eastman was sketching as he went. But I’ll also say he did the sketches almost on autopilot, good sketches in about 8-10 minutes. I never considered getting a sketch from Eastman. I didn't think he would be drawing. But there we were. While waiting in the line, one of the handlers came up and told us ‘this line is so much better than yesterday. You’ll never get as good a chance at getting a sketch from him. We capped the line yesterday." I asked this handler running the line if Eastman only did TMNT characters or would he do Supergirl. The handler said only Turtle characters. But I figured that I would ask again as I got closer to his table. I also assumed, perhaps wrongly, that the closer I got to Eastman, the more senior the handler was. So as I got closer I asked another handler. ‘Look, I have a sketch book with Supergirl pics, would he do one.’ He didn't think so. But I pushed “What if I say draw April O'Neil but put her in a Supergirl shirt?” I thought maybe I could backtrack into a sketch. Luck will oft save a man if his courage holds. The guy chuckled and then told me to hold on. He then asked yet another handler, one even closer to Eastman. I felt like I was working my way up the Corleone family tree approaching the Don. I took out my sketch book and now the handler closest to Eastman came up to me. 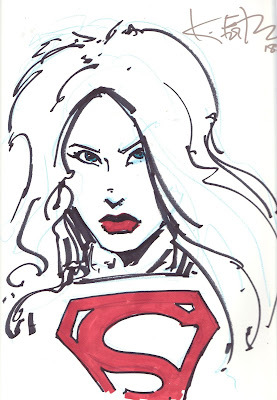 I again said I have a Supergirl book and would love an Eastman sketch. He asked to look through the book. It’s my main sketch book so it has many big names. And I can see the handler floored by it. The other handler looked over this one's shoulder. Both were nodding, quite impressed. About halfway through flipping through the book, the final handler said ‘hold on’. He then went up to Eastman, whispered in his ear as he was drawing another cover for the guy ahead of me. Eastman pulled out a blue pencil and does the layout and then used markers to finish (see pics above). He said he had never ... in 40 yrs of being a comic artist ... drawn Supergirl. Not even as a doodle. He added some color. The handler came over and said to me that having the book was great. It allowed him to see the level of stuff that I had. Behold the finished product, the only existing Kevin Eastman Supergirl sketch in existence. Brilliant. And it just goes to show that sometimes you have to keep asking. 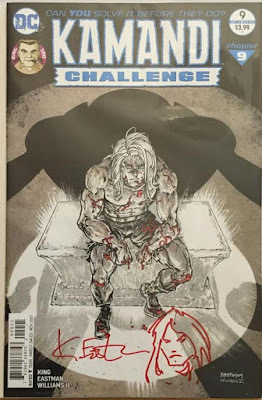 Of course, I did get Kamandi signed as well. And Eastman did a little remarque Kamandi on the cover as well. If you haven't read this issue, please do. You can read it as a stand alone. I found it gut wrenching. Now I hope I run into Tom King again to get this signed. And yes, I did meet Kevin Nash. I got a picture taken with him as well because when you are NWO, you are NWO 4 LIFE!! So even though I didn't have high expectations for this con, and maybe because I went in free without expectations, I had a phenomenal time. Pictures with Vandervoort and Nash? An Eastman commission? Incredible! Hah! Super-Family fans are expert in beating the odds. We learnt from the best ones. Congratulations on meeting Vandervoort again and manage to sound articulate. Sigh. I really need a Smallville/Supergirl crossover. Even if Kara is the only Smallville character to make an appearance. Kevin Eastman... Wow. I'm an early 80's kid, and the TMNT are a huge part of my childhood. 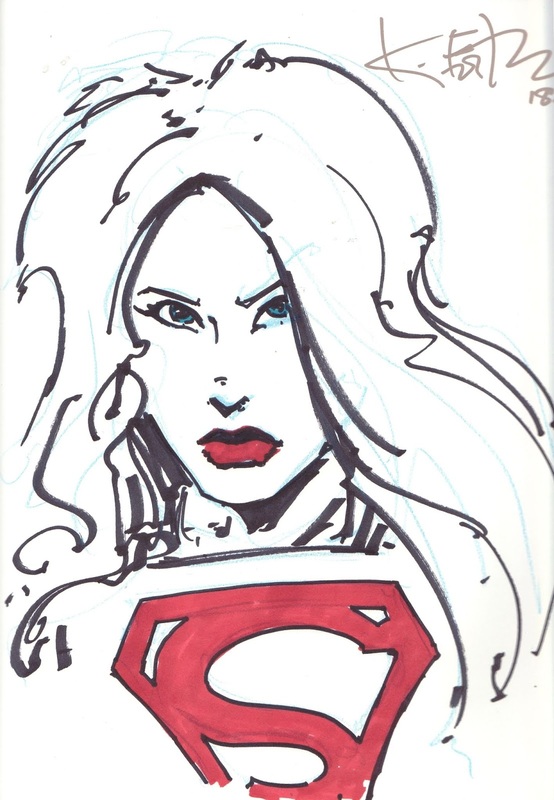 And you got the only Supergirl sketch he has ever made against all odds. Congratulations! And even though he improvised, it is a great sketch. Well done! That's a fine, one-of-a-kind Eastman commission.